Three heliostats installed on the roof of a 23 story building in New York City will provide much needed light in the planned Teardrop Park South. The park likes in the shadow of three skyscrapers, and never gets direct sunlight. A heliostat is a device that uses a single mirror to track the sun and then deliver a beam of light to a selected location. Each of the three heliostats used in NYC are about eight feet in diameter, and cost $355,000. In the novelization of Star Wars: The Revenge of the Sith, orbital mirrors play an important part in the battle over Coruscant, the capital city of the Republic. The beams of the mirrors are redirected to shine on a huge reservoir, vaporizing it and shorting out the planet's defense shield. 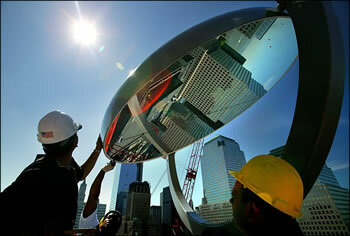 Ordinarily, the mirrors are used to provide more hours of daylight around the capital city. I'm sure there must be early mentions of orbital mirrors providing light to the surface; perhaps helpful readers can fill us all in with a comment (see below). Update: 04-Mar-2015: See Theodore Sturgeon's orbital mirror from his 1941 story Completely Automatic. End update. The Russians made a valiant attempt to use a mirror to reflect sunlight onto various regions in the former Soviet republics in 1999. 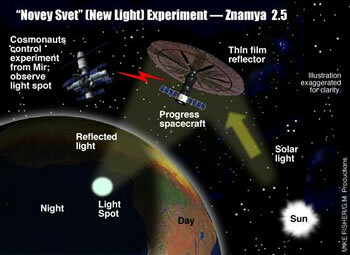 The Znamya ('Banner') experiment was intended to put a circle of light 5-8 kilometers across, moving at 7 yards per second, on the earth's surface. The mirror was intended to be used as a prototype for larger models to provide light for Russia's northern cities. Unfortunately, the 1999 Znamya experiment failed when the mirror failed to deploy properly in space. In an opposite view of this story (that is, Earth needs less sunlight, not more) read Reduce Sunlight By Blocking Solar Rays. Read more about the New York City Heliostats, the Znamya program, and the history of heliostats.